Looking for the absolute best graphics card for gaming? That’s easy: Titan X. But “best” and “best within reason” are different stories. For most gamers, the choice between the GTX 980 Ti and Titan X won’t be too hard; the 980 Ti is right on the heels of the Titan X in all of our single-GPU tests, and even at 4K the gap is only a few percent at most. Unless you’re running multiple high-resolution displays, like say three QHD panels, or even three UWQHD curved displays (drool! ), for most users the 980 Ti is the hands-down winner based on pricing. Yes, the Titan X still reigns as king, but the young prince is every bit as capable and a lot more attractive at the end of the day. That final few percent comes with a 50 percent increase in cost, a classic case of greatly diminishing returns. And if you’re looking at doubling down on Titan X, there’s another possibility to consider: 3-Way SLI 980 Ti, which costs as much as two Titan X cards. We’ve tested the 980 Ti against the current crop of high-end competition, we’ve overclocked it, and we’ve run two 980 Ti cards in SLI for extreme performance. The only thing left is to triple our pleasure with 3-way SLI! Yes, we hear you: “What about giving us a barber shop quartet with 4-Way SLI! ?” We don’t have a fourth card on hand, sadly, so for now, we'll have to stick with three cards. Maybe a rain check? For this round of testing, we have the two EVGA GeForce GTX 980 Ti ACX 2.0+ cards from before, matched up with the reference 980 Ti from the launch article. Mismatched GPUs in SLI? It’s a terrible aesthetic crime, we know, but these things must be tested—for science! That looks pretty grim, and as we’ll see below, the results, for 3-way SLI at least, aren’t far off. In fact, in some cases we might even see performance decreases when moving beyond two GPUs. Adding more GPUs creates more work for the system as a whole, and the CPU in particular has to spend more time splitting up the workload. The net result is that if you’re running at resolutions where you’re already bottlenecked by the CPU (e.g., 1920x1080), adding another GPU to the mix and making the CPU have to do that much more work doesn’t help. Think of it as an assembly line, where a task gets broken down into increasingly smaller parts. There is an optimal number of stages for a given task; go beyond that point and rather than helping, you create chaos. One head chef (i.e., CPU) in a kitchen with six assistants (let’s say six assistants equals one GPU) is manageable; one head chef with 60 assistants waiting for input is a recipe for disaster. Again, DX12 with its multi-threaded driver model should help quite a bit, as it means having a multi-core CPU is like adding additional head chefs, each with a little kitchen to manage. There will still be bottlenecks that prevent scaling to an arbitrary number of CPU cores and GPUs, but at the very least, we should see better scaling with both CPU cores and number of GPUs than we’re currently seeing with DX11. For the following tables, we've bolded results in the 3-way columns where scaling is greater than 200%, meaning it's higher than what two GPUs could possibly achieve. Similarly, we've marked 3-way scores in red where performance is less than the 2-way result—because nobody shelling out for 3-way SLI wants to see negative scaling! There’s a lot to digest in that little table—and a lot of blood, sweat, and cursing in there as well, if you look closely—so let’s start with the easy stuff. If you’re running at a lower resolution like 1080p, and you’re not using something like Nvidia’s DSR (Dynamic Scalable Resolution) to improve image quality, 3-way SLI with cards as powerful as the 980 Ti is overkill in a big way. Several games show little to no improvement going from 2-way to 3-way SLI, and in fact, there are even minor regressions in a few cases. One of those is Metro: Last Light, however, and with the bugged 353.06 drivers not working, we would assume there’s room for improvement once that gets sorted out. Hitman: Absolution and Batman: Arkham Origins fail to benefit much at lower resolutions, so short of increasing the GPU load with 8xMSAA—and in the case of Batman, PhysX—there’s not a whole lot to be gained from a third 980 Ti. The best “game” for scaling ends up being Unigine Heaven… except that’s not actually a game. Oops. Tomb Raider wins for best overall scaling, showing an impressive improvement in frame rates at all three resolutions. Perhaps more importantly, if you’re running—or hoping to run—a 4K display, outside of Metro: Last Light, we see respectable gains in all of our gaming tests. 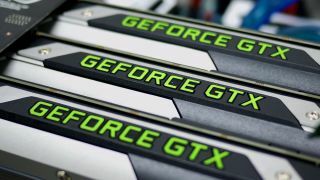 Spending 50 percent more to get 20–30 percent more performance than two 980 Ti cards isn’t necessary, perhaps, but at the same time, there are people who are willing to spend 50 percent more to get a Titan X instead of a 980 Ti. As a “poor man’s alternative,” 3-way 980 Ti will definitely beat 2-way Titan X SLI in current games. As we discussed in the 2-way SLI piece, however, there are other potential pitfalls. Where average frame rates are generally greater than or equal to the 2-way results, minimum frame rates in a few cases take a sizable hit. We wouldn’t place too much emphasis on Unigine Heaven, as the minimum frames per second reported there tends to be a single instantaneous minimum, but The Witcher 3 definitely has issues with the current drivers creating a lot of stuttering, i.e., at QHD and 4K, minimum frame rates are actually lower than what we measured with a single 980 Ti. That's bad, and since we're using FRAPS and reporting 97 percentile frame rates, it's something you will definitely notice. Conversely, other games—e.g., GTAV and Hitman: Absolution—show better improvements to minimum fps than average fps. We’re not here to make a judgement call on whether 980 Ti 3-way SLI is worth the money. Anyone considering such a solution should be well aware of the law of diminishing returns. We’re also still waiting to see more GTX 980 Ti cards in stock, and there’s nothing wrong with starting at a single GPU and then moving to 2-way and later 3-way SLI as needed. Of course 2-way SLI is generally an easier and more economical option, since all you need are a couple of x16 PCIe slots, a moderate 600W–750W PSU, and a standard SLI bridge. Three-way also typically means using Intel’s more expensive LGA2011 platform, currently in its third iteration with Haswell-E and the X99 chipset, which is another expense—and don’t get us started on the space heater aspects of gaming on such a system; nice for the winter, not so much in the summer. But if you’re jonesing for some 3-way SLI action, it’s here, it’s fast, and when Windows 10 and DX12 roll out later this year, we may end up pleasantly surprised.